It freakin' breaks my heart to read that list of dates. That's awful! I wonder if they had any children that lived. 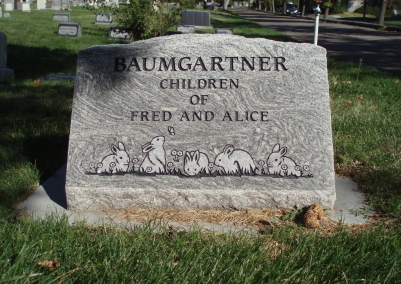 My great-grandparents lost five or six children in infancy or early childhood around the same time (coincidentally, between 1914 and 1919, like the Baumgartners). I think the sad thing about this headstone is that there are three sons who weren't even named...do they count? I think the sad thing about this headstone is that there are three sons who weren't even named...do they count? Questions like these occurred to me, too, hm-uk & Juti. 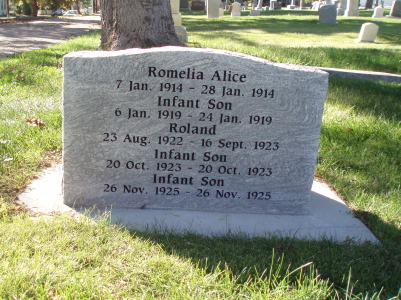 I also think it's significant that the parents aren't buried anywhere near these five children. Did they move away to escape the tragedy of Salt Lake? Did they have no one to carry out their wishes and bury them where they wanted to be? What the hell happened? Part of why I find the headstone so heartbreaking isn't just that it lists five children who died in early infancy; it's that it tells nothing else. It's just the barest outline of a long-lasting tragedy. fyi--I was walking through this cemetery a few days ago, and this headstone was bedecked with a wreath of holly and pine, a silver foil Christmas tree, and other things. I can't know, of course, if they were put there by relatives of the Baumgartners or just someone like me, who was struck and moved by the loss the headstone commemorates. But I thought people would like to know that someone continues to memorialize these short lives. thanks for the link to your blog. I've noticed Mt. Olivet on my way to my doctor's office or Red Butte Gardens, but I haven't stopped to explore it. I will make a point of doing that soon. This page contains a single entry by Holly published on November 15, 2008 5:36 PM. I Need to Get This Out of the Way was the previous entry in this blog. A Couple of Things About Queer Rights Discourse I Would Like to See Changed is the next entry in this blog.